Asia's leading online travel agency is looking for passionate developers to join them in one of the world's most exciting cities—grab this opportunity while you can! Technology is not just what we do—it’s at the heart of who we are. We love innovation and putting new technologies to work to extend our lead on the competition. If you join us, your work will impact what we do around the globe. We move fast—why wait for ages to see your ideas go live? Work on tough challenges, safe in the knowledge that you're surrounded by people as smart as you are (if not smarter!) to help solve them. Are you passionate about the craft of software development and constantly working to improve your knowledge and skills? This is the perfect opportunity to do just that. Apply and let's talk about all the exciting projects we have in the works! You're a top-notch developer with extensive knowledge in Scala, Java or C#. You have a strong background in the design and implementation of scalable architecture and a good understanding of algorithms, data structures, and design patterns. You have 3+ years’ experience under your belt developing performance-critical applications that run in a production environment. You have RDBMS knowledge (SQL Server, Oracle, MyQSL or other). Bonus points for knowledge in one or more of the following: NoSQL (particularly Cassandra), Queueing system experience (Kafka, RabbitMQ, ActiveMQ, MSMQ), Play framework, Akka library and/or Hadoop. 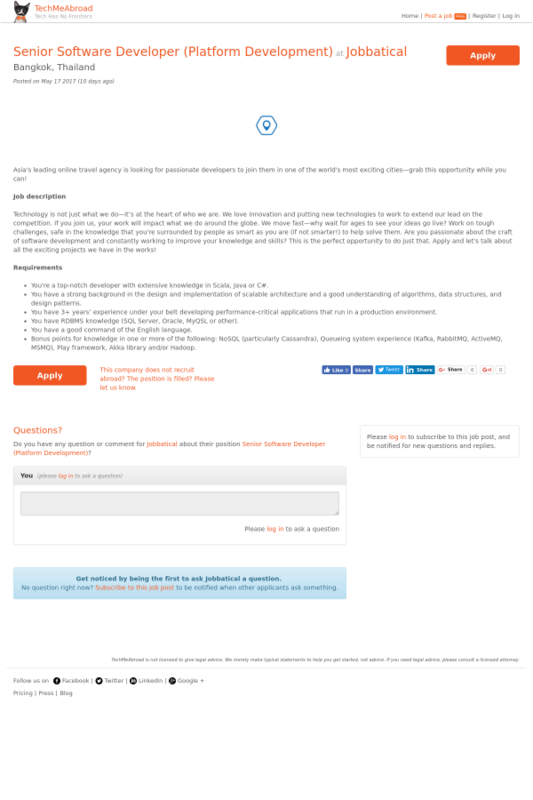 Do you have any question or comment for Jobbatical about their position Senior Software Developer (Platform Development) ?